A specific sequence and protocol must be followed under IRC Section 1368 when S Corp cash and/or assets are actually distributed to S Corp shareholders. Each “tier” of distribution must be reduced to zero before moving into the next tier of distribution. Here is the sequence of taxation that must be followed when these distributions take place. For simplicity, assume the S Corp shareholder owns 100% of the shares of the company. S Corps are “pass-through” tax entities where K-1 net profits are taxed to the S Corp shareholder personally on Schedule E of their Form 1040 U.S. Income Tax return. 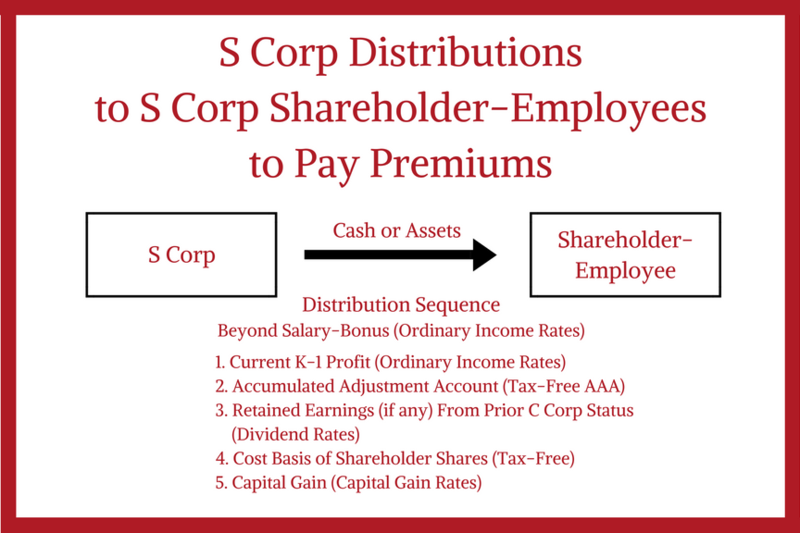 Note: The S Corp distribution tiers described in this article are above and beyond any salary or bonus earned income paid to the S Corp shareholder as an employee. Salary and bonuses are considered to be earned income subject to all FICA taxes for OASDI and HI. S Corp tier distributions are not considered to be earned income and are not subject to FICA taxes. All S Corp Net Profit (business income minus business expenses) for the current tax year is passed-through as K-1 ordinary income to the S Corp shareholder. For tax year 2016 and beyond, ordinary income may be taxed at a top federal rate of 39.6% for high income S Corp owners. Plus, an additional 3.8% tax on passive interest and rental income as a result of the Affordable Care Act (ObamaCare) is still in effect for certain high earners. The combined marginal tax rate on ordinary income for high income S Corp owners could be as high as 43.4%. All S Corp Accumulated Adjustments Account (AAA) is distributed tax free to the S Corp shareholder. This AAA account is a tax accounting entry for all previously taxed K-1 income that has been left in the S Corp and was not distributed to the shareholder in prior tax years. Some professionals refer to this AAA account for S Corps as previously taxed profits or previously taxed income. This AAA tier of distribution is important to verify because it can provide a tax free technique to fund personal insurance needs. The most recent Form 1120S U.S. Income Tax Return for an S Corp would be a good source to verify the AAA account. All locked-in retained earnings from S Corps that previously had C Corp status are distributed as a non-deductible dividend distribution to the S Corp shareholder. For tax year 2016 and beyond, qualified dividends are taxed at only a 15-20% federal rate. Plus, an additional 3.8% tax on passive dividend income as a result of the Affordable Care Act (ObamaCare) is still in effect for certain high income earners. The combined marginal tax rate on dividend income for high income S Corp owners could be as high as 23.8%. To accelerate taxable dividend distributions from Tier 3 up to Tier 2, a tier switch under IRC Section 1368(e)(3) can be elected. Accordingly, S Corp owners can take advantage of this tier switch to unlock retained earnings from prior C Corp status and be taxed currently. All Cost Basis which the S Corp shareholder has in the shares of the company is distributed tax free to the S Corp shareholder. This cost basis is the original capital with which the shareholder started the corporation PLUS any paid-in capital the shareholder added to the company over the years the company has been in operation. Finally, any additional asset value beyond Tier 4 cost basis is distributed as Capital Gain to the S Corp shareholder. For tax year 2016 and beyond, capital gains are taxed at a 15-20% federal rate. Plus, an additional 3.8% tax on passive capital gain income as a result of the Affordable Care Act (ObamaCare) is still in effect for certain high earners. The combined marginal tax rate on capital gain income for high income S Corp owners could be as high as 23.8%. Assume a 100% S Corp owner is 60 years old and is in the highest personal income tax bracket for 2016 (39.6%). The S Corp has $400,000 of Tier 1 pass-through K-1 profit in the current year and $500,000 of Tier 2 previously taxed Accumulated Adjustment Account (AAA). The client wishes to make a tax free withdrawal from the AAA account to pay the taxes on the K-1 profit and use the full $400,000 of K-1 profit to fund personal financial needs using tax-favored financial products. Tier 1 K-1 Profit (Ordinary Income) … $400,000 x 39.6% = $158,400 tax. The $400,000 K-1 profit distribution can be placed in a personal side fund where annual withdrawals could be made to fund annual premiums for a non-MEC personally owned life insurance policy. The policy could be no-lapse guaranteed UL policy, a current assumption UL policy, an indexed UL policy or a whole life policy depending on the retirement needs and risk tolerance of the S Corp owner. Or the $400,000 K-1 profit distribution could be gifted using $400,000 of lifetime gift exemption to a no-lapse UL or no-lapse SUL policy owned by an Irrevocable Life Insurance Trust (ILIT) if estate tax free death benefits are required based on the facts of the case. Contact your BSMG Advisor for a discussion of the life insurance funding possibilities for your S Corp clients. Your Advisor will work with BSMG’s tax accounting and advanced planning specialists to design the most efficient insurance funding for your S Corp business owner clients.